How serious is Buffett’s condition? What’s next for Berkshire’s stock? 1. How serious is Buffett’s condition? Buffett says his doctors have told him his condition is “not remotely life-threatening or even debilitating in any meaningful way.” There is no evidence of cancer elsewhere, and Buffett and his doctors are so confident in his health that they’re waiting until mid-July to begin a two-month treatment of daily radiation. In other words, at least when it comes to Uncle Warren’s health, we can all exhale. 2. What’s next for Berkshire? Buffett will face a firehouse of questions about succession planning at the upcoming Berkshire annual meeting, but he should hold off on naming names, given the lack of seeming danger in his prognosis. Shareholders would gain nothing today by learning the name of Berkshire’s next CEO. In fact, Buffett’s showing his cards could cost Berkshire shareholders. Buffett’s early diagnosis and treatment means he’ll very likely sidestep this health problem, which means he could still be comfortably managing Berkshire day to day for at least several more years. Proclaiming a successor today would rob Buffett of several more years to evaluate the primary candidates — Ajit Jain, Matt Rose, and Greg Abel — and dishearten the short-listers who get passed over. Meanwhile, business will go on as usual at Berkshire despite Buffett’s cancer. Other than his radiation treatments curtailing his travel, Buffett has no plans to change his daily routine. Not that I’d be concerned if Buffett did take a break — he is a famously hands-off manager who gives the CEOs of Berkshire’s operating companies a wide berth. In fact, the autonomy that his lieutenants have is a big part of Berkshire’s success. There’s no company in the world that would miss its CEO less on a day-to-day basis than Berkshire Hathaway. That’s by Buffett’s own design and is a testament to the quality of Berkshire’s people. 3. What’s next for Berkshire’s stock? And here’s where things get tricky. On one hand, Buffett’s investing prowess and the sweetheart deals he lands for Berkshire are irreplaceable. Worse is that questions about Buffett’s health and succession — which were already a monkey on the back of Berkshire’s stock — will reach a fever pitch and stay that way through the remainder of Buffett’s tenure. But here’s a triple load of good news. First, Buffett doesn’t appear to be going anywhere anytime soon. Second, Berkshire today is an amalgamation of wide-moat, long-view businesses that Buffett himself has carefully selected over time. Berkshire is built to last. Third, much like Apple‘s (Nasdaq: AAPL) shares before Steve Jobs left this world, the market is already pricing a post-Buffett world into Berkshire’s stock price. Berkshire today sells for less than 1.2 times book value — a 23% discount to its 10-year average — and recently drove the typically cagey Buffett to say “[Berkshire’s] stock is selling at a material discount to the company’s intrinsic business value, conservatively calculated.” That’s as close to “Dude, this stock is stupid cheap” as you’ll get from Buffett. BRK-A Price / Book Value data by YCharts. 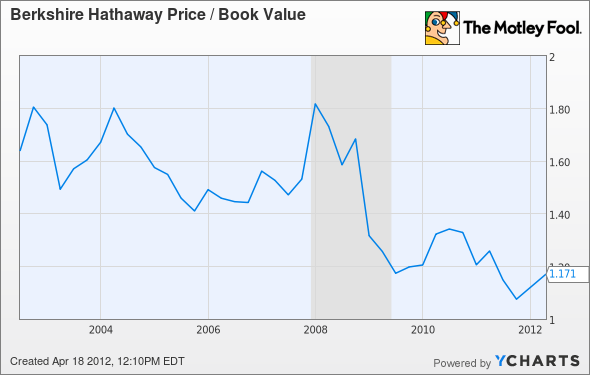 Berkshire recently authorized a sweeping, open-ended repurchase plan to capitalize on a cheap Berkshire stock should it fall below 1.1 times book value. That leaves today’s Berkshire buyers with a safety net of a buyback program at only 6% below today’s prices and upside of 30% if Berkshire coasts back to historical norms. Strap that fat discount on top of the compounding machine that is Berkshire and you’re looking at one luscious buying opportunity — Buffett or no Buffett. Berkshire is my family’s largest holding and will stay that way, barring a dramatic turn of events. And if the market throws a fit and sends Berkshire’s shares cascading, don’t be surprised to see me in line waiting to take shares off the hands of fretful buyers. As the Oracle of Omaha himself is fond of saying, be fearful when others are greedy, and greedy when others are fearful. And here’s wishing Warren a speedy recovery. If you’re looking for investing ideas, look no further than “2 Stocks Warren Buffett Wishes He Could Buy”. The size of Warren Buffett’s company, Berkshire Hathaway, means his investment universe is now limited to very, very large businesses, but individual investors don’t have that limitation. Click here now to find out the names of two companies we’ve used Buffett’s own criteria to identify. But hurry – the report is free for only a limited time. The Motley Fool’s purpose is to educate, amuse and enrich investors. This article contains general investment advice only (under AFSL 400691). Authorised by Bruce Jackson. Click here to be enlightened by The Motley Fool’s disclosure policy.